Computer-based National Exam (UNBK) for junior (SMP) and high school (SMA and SMK) students and also national standard school exam (USBN) for elementary (SD) students in Jakarta have gone well. In the future, elementary school infrastructures will be repaired soon thus UNBK can be done at the location.
" All have been done well without any problem and cheating"
"All have been done well without any problem and cheating. 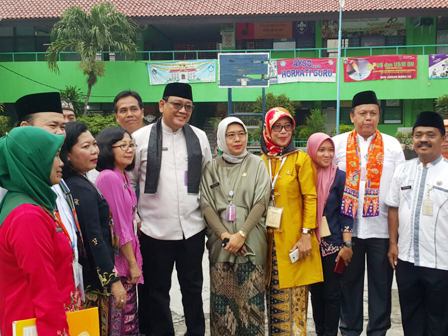 On this last day, the exam in SMA, SMK, SMP and SD have gone well," mentioned Sopan Adrianto, Head of Jakarta Education Dept. at SDN Johar Baru 10, Central Jakarta, Friday (5/4). According to him, there are around 2,400 SD and other schools at the same level in Jakarta. Thus it doesn't need to repair classroom or building facilities, especially for room to store the computers. "We will repair it gradually thus it will be ready if someday the exam is implemented," he conveyed.